We’d love your help. 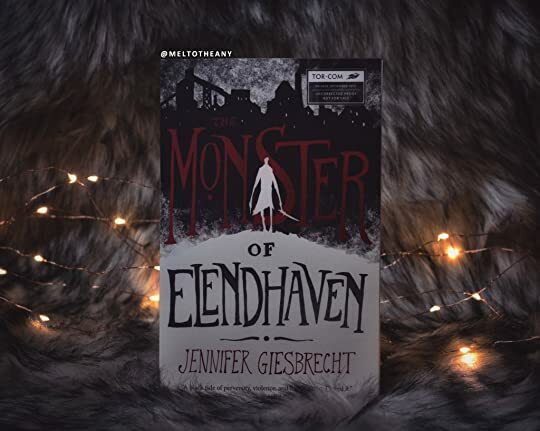 Let us know what’s wrong with this preview of The Monster of Elendhaven by Jennifer Giesbrecht. To ask other readers questions about The Monster of Elendhaven, please sign up. Stacie That cover is gorgeous! Together, they launch a plan so dark and cruel that readers will find themselves cheering for blood, and for these avengers to consummate their horrible passion for each other. - Technically A Love Story"
...I want to read this now? Also, I've heard it's gay. Giesbrecht is my mom's maiden name so I'm just gonna go ahead and pretend that this awesome sounding book was written by a relative! The Monster of Elendhaven is a dark fantasy, a twisted tale of revenge set in an original world as oily and real as Jack the Ripper’s London. After a thing with no name washes up on the docks, empty, alone, and unable to die, he becomes obsessed with a frail young man who can twist minds with magic. Together, they launch a plan so dark and cruel that readers will find themselves cheering for blood, and for these avengers to consummate their horrible passion for each other. But the pair are being hunted by officials from the south, intent on saving the world from the horrors mages can unleash. I want to thank the publisher and author for an advanced reading copy of The Monster of Elendhaven in exchange for an honest review. Receiving this ARC did not influence my thoughts or opinions on the novella. 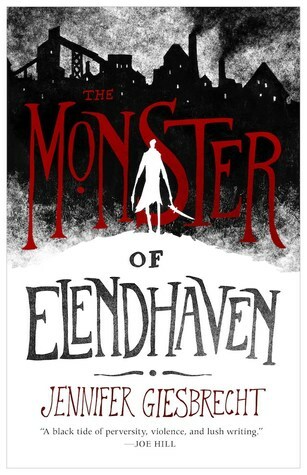 The Monster of Elendhaven is immensely mesmerizing with its darkly gorgeous prose and deftly jarring substance. It is an immortal and obsessive nightmare from the sea, ready to dig its claws into your flesh. For a long time, he didn’t have a name. What he had were long white fingers that hooked into purses and a mouth that told easy lies. What he had were eyes that remembered faces, feet that knew the alleys, palms that grew calloused and soot stained from crawling through the cobblestone streets. He got the name when he was three feet and four inches tall, kneeling on the dock with a coin in his palm, from a sailor who stank of rum and fish oil. The sailor grabbed him by the back of the neck and slammed his head into the wall—once, twice, three times—and then yanked the coin from his hand. His lip split on the dock and his mouth filled with a foul mixture of grease, salt, and blood. I was hooked by those long white fingers for the entire 159 pages. This is a novella that does not let up in its originality or gothic darkness. It is unlike anything I have ever read and just goes to show that Tor.com publishing is here to stay for the long-haul. This is a quick read - I got through this novella in a single sitting - but its no less impactful for that. A huge amount of story is carefully folded into this delicately wrought story, filled with dark pockets containing darker gems. Johann grows up on the streets of Elendhaven, discovering he has a few unusual talents - one of which is performing actions of ruthless, calculated violence. Florian was born to one of the dying city's great families. His delicate, efete and fragile exterior hides an alarming sense of purpose. Events draw the pair together and what lovely and terrible darkness they will make together. Book: monsters, murder, magic, other cool things beginning with M.
Me: hello yes please when can I read this. this sounds like everything i ever needed?? This book was the dark and gore-filled companion to Susana Clarke’s Jonathan Strange and Mr Norrell. The prose is exquisite and the violence portrayed with complete beauty. Tor.com is THE imprint for genre-bending, Cross-the-border fiction. Grimy and dark and fucked-up and absolutely delicious. A deliciously dark fantasia that will appeal to fans of the Dishonored and Bioshock franchises. Fantasy readers shouldn't miss out on this violent, delightful treat.